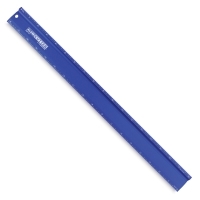 AlumiCutter Rulers let you measure and cut without changing tools! Made from sturdy yet lightweight extruded aluminum, AlumiCutters feature a raised edge that's ideal for inking, plus a groove that protects your fingers while cutting. The recessed, non-slip neoprene backing helps keep the AlumiCutter firmly in position with just a light touch. Rulers are marked in 16ths on both edges. The first two inches are measured in 32nds. Steel Edge AlumiCutter — Designed especially for heavy-duty cutting purposes, this AlumiCutter has a steel edge that can safely be used with a rotary blade. AlumiCutter — This AlumiCutter is ideal for use with a standard hobby knife.